Biting into a perfectly tender piece of meat has to be one of life’s most satisfying sensations. Being such a huge advocate of carnivorism, I find it to be verging on criminal when I’m presented with a gorgeous looking piece of meat that, for all intents and purposes, has been wasted due to it being tough to eat. 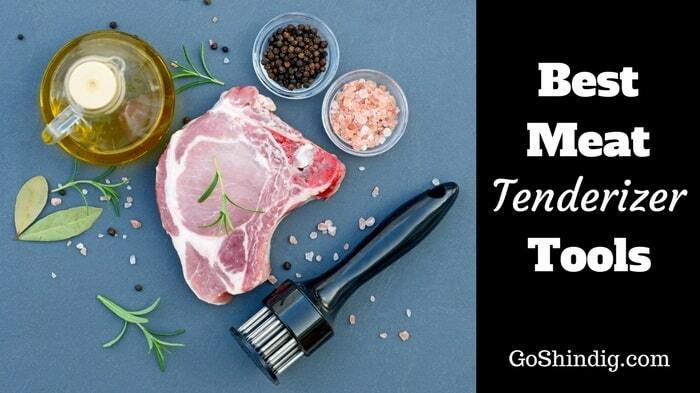 How to tenderize meat properly, the best meat tenderizer tools to use and the benefits of tenderizing meat is paramount knowledge to have in your arsenal for any self-respecting home cook and especially the barbeque enthusiast. Of course, you can purchase meat that is naturally tender and will melt in your mouth when eating it but these cuts will almost always be on the more expensive side of the spectrum. Buying cheaper cuts and using a meat tenderizer can prove to be a cost-efficient way of achieving tasty, tender meat that can be enjoyed by friends and family. The added benefit here is that cuts of meat that you would normally associate as being intrinsically tough such as flank or skirt steak are normally the ones that are the most flavorsome. So, what’s going on? Why is it that certain meats are naturally more tender than others, how does tenderizing meat make a difference and what is the best way to tenderize meat? Well, I invite you to read on and hopefully I can enlighten you a little on some of these and other questions. 1 What Makes Meat Tender? 2 What Does Using a Meat Tenderizer Tool Do? 3 What are the Benefits of Using a Meat Tenderizer Tool? Meat tenderness depends on a number of factors. Firstly, you have to remember that meat is just muscle and that muscles are complex things made from fibers and fats and protein filaments which are normally referred to as collagen. Tenderness is not an exact science but can be determined by things such as the age of the animal, the stress it endured both in life and death, the composition of the muscle i.e. the amounts of collagen present and the dispersal of fat throughout the muscle. The last point there in particular seems to have a sizable bearing on the tenderness of a meat. When thinking of a cut of meat with fat running throughout it, we say it has a lot of marbling. What this marbling does in cuts like a rib eye is melt when introduced to high heats which in turn spreads through the meat keeping it moisturized whilst cooking and therefore stopping the meat from drying out which is the root cause of tough meat. What Does Using a Meat Tenderizer Tool Do? Tenderizing meat breaks down the muscle and the collagen present in it so that it produces gelatin which further adds moisture to the meat when cooking. This is achieved through various meat tenderizing tools such as meat hammers, meat pounders, meat cubers and meat tenderizing powders. Meat can also be tenderized using natural ingredients such as fruits which normally contain some sort of enzyme with papaya and pineapple being particularly popular. What are the Benefits of Using a Meat Tenderizer Tool? As alluded to in the intro, tenderizing your meat is cost-effective and can drastically reduce your expenditure by allowing you to choose leaner, tougher cuts of meat that do not possess the marbling that more expensive cuts have. Depending on how you tenderize your meat, marinating becomes a more effective and less time-consuming process. Using a tenderizer with needles will allow you to punch holes into the meat which the marinade can easily permeate giving you a more flavorsome piece of meat. Meat tenderizing tools broadly fit into three categories which, let’s face it, are broadly all incredibly similar in design and function within their own category. The most recognizable of these tools is the meat hammer or as it’s also known the meat mallet. Meat Hammer – I think everyone remembers the old school wooden meat hammers that used to frequent our kitchens in childhood, mainly as they were a great weapon to use against annoying siblings. One bash over the head followed by the inevitable crying fit was all it took to experience the wrath of mom and dad, but it never stopped me. Modern meat hammers can be found in a number of materials such as classic wood, metal and plastic and consist of a strong, sturdy grip and a head with two faces – one smooth and one textured. The textured side has pyramid-like dimples on it which are used to break down connecting tissue but not so much so that the meat will go too soft. This is possible if you overwork the meat and will result in a mushy textured cut of meat when cooking it. The opposite face on the hammer is flat and is used as a meat pounder. Using a meat pounder is beneficial when you require a nice uniform sized piece of meat that you know will cook evenly when introduced to the grill. Meat Tenderizer Machine – OK, so there’s no official name for these meat tenderizer tools but I generally get by with calling them meat tenderizer machines. These are the tenderizing gadgets that come with a lot of sharp needles so that you can puncture your way through lean, tough cuts of meat. What these meat tenderizer machines do is sever the connecting tissues and long muscle fibers which in turn lead to a couple of things happening. Firstly, as the meat is now full of puncture holes, it will allow heat from the grill to permeate a lot quicker which reduces cooking time. Reducing cooking time aids your meat as you are able to save a lot of precious moisture within it that is normally lost when having to cook over a longer period. Marinating also becomes a lot quicker and a lot more effective as the holes draw the marinade into the meat to provide uniform flavor instead of waiting for normal marinades to do their job by just sitting on top of the meat. I would estimate that marinating meat which you have used with a meat tenderizer machine will take around five minutes to see the same results as a normal three hour marinade. Meat Cuber – Using a meat cuber is a very similar experience to that of using a pasta machine or a meat grinder. It has an opening, or a chute, at the top where meat is passed through and flattened and tenderized by manually turning a crank. The term meat cuber comes around because of the indentations that are left on the meat after it has passed through the machine. Cube steak, which is a top sirloin or top round cut, is what you will more than likely be using when cooking chicken fried steak. OXO Softworks Meat Tenderizer – Here at GoShindig, we often recommend OXO products and it is with good reason. They make products that are simple, well made, durable and do exactly what they are supposed to do. The OXO softworks meat tenderizer tool is a meat hammer that carries a good solid weight to it and is designed so that it feels good in your hand and when using it. The handle is soft and contoured whilst providing an all-important non-slip property to it. It is also dishwasher safe so there is minimal clean-up to do after use. As with most meat hammers, this can be used to perform other tasks such as crushing up nuts that you can serve in desserts or salads. Kitchenaid Meat Tenderizer– We all know and love kitchenaid for their stand mixers, they seem to be a national institution. They also make other cool kitchen gadgets like their meat hammer. The Kitchenaid meat tenderizer tool is a single cast piece of equipment made from aluminum. This means that the meat hammerhead will never come loose or go a bit wobbly. It is also aesthetically beautiful and will find a place in any modern kitchen worth its salt. What I really like about this meat hammer is that there is a one-year hassle-free replacement and a lifetime limited warranty that comes with it. Let’s be honest, for 15 bucks and under, it’s not a deal breaker but it is good to know you are buying from a reputable company with a history of good after sales. Jaccard Supertendermatic 48-Blade Tenderizer– The original and still the best. You just have to look at the number of reviews and quality of them all over the web to realize that the grand-daddy of them all is still doing its thing. The Jaccard meat tenderizer machine comes with 48 stainless steel knives that are extremely sharp and extremely hard. The 301 stainless steel is made with a 48 Rockwell hardness and double-edged sharpness. Some of the boasts that the Jaccard meat tenderizer can make include a 40% reduction in cooking time, a 600% increase in absorption when marinating and less shrinkage which will provide a more even cooking experience. Ccfoud Meat Tenderizer – This is fast becoming my new favorite tenderizer! The Jaccard meat tenderizer is still the best and will always have a place in my kitchen but the Ccfoud makes the whole process of tenderizing meat an absolute joy. The design of the Ccfoud meat tenderizer machine means I get more of a meaningful grip compared to the more traditional tool where there is a press down motion. This lets me penetrate the meat without having to get anywhere near it whereas normally I will be washing my hands constantly after coming into contact with raw meat. The Ccfoud, like the Jaccard, has 48 stainless steel blades which come with a safety cover. This is a great feature that is lacking in some other meat tenderizer machines. There is also a 1 year money back guarantee for any dissatisfied reasons. Weston Meat Cuber – For large amounts of meat that need tenderizing you can’t really go wrong with a meat cuber. It will take anything you throw at it and churn it out perfectly cubed ready for you to slap on the grill. The Weston meat Cuber is made from cast aluminum with stainless steel working parts. It works extremely well with tougher cuts of meat as well as meats like game and venison. There are options to buy a slicer with this meat cuber also so you can slice yourself some lovely jerky. Meat Tenderizer Powder – Meat tenderizing powder allows you to omit the brute strength that is sometimes required with mechanical tenderization. Using meat tenderizer powder involves a process called enzymatic tenderization. What this basically means is that the powder contains natural enzymes which break down muscle fiber and collagen the same way that mechanical tenderizers do. The natural enzymes are usually papain, which is found in papaya, and bromelain which is found in pineapple. There are basically two options that I would consider when buying meat tenderizer powder – McCormicks or Adolphs meat tenderizer, both of which contain bromelain. Adolphs meat tenderizer powder is the one that I would recommend most however, mainly down to the point of price. You get 44.5 ounces for under 20 bucks which is surely a bargain in anyone’s eye. McCormicks meat tenderizer powder can’t live with that price point but in my opinion gives a slightly fresher, cleaner taste to the meat. It is only the slightest of difference though so it may have no bearing on your decision. Whichever meat tenderizer powder you decide upon I thoroughly recommend just aiding the process by piercing your meat several times with a pointy knife or fork. This will help the tenderizer powder seep into the meat a little better and do its job more efficiently. Acids – Introducing acids too your cuts of meat helps with the tenderizing process. Things like vinegar or citrus are great examples of acids that can be used to tenderize meat. However, timing is key – leaving your meat to tenderize too long when using acids may actually cause it to toughen. Strong acids shouldn’t be left to marinade on your meat for longer than two hours. Sharp knives – The process of actually thinly slicing your meat will make even the toughest piece seem luxuriously tender. Visit our page on the best bbq knives to see what we recommend. Low and Slow – OK, so this goes against the whole theme of this article but the best way to get perfectly tender, succulent, juicy, flavorsome meat is to cook the meat low and slow. This breaks down all the muscle fibers over a period of hours under a low heat whilst surrounded by some kind of stock. Best done in a Dutch oven, this provides the perfect environment for your meat to tenderize fully whilst retaining, and adding, bags of moisture. question: i’m just getting back into cooking again. out more quickly, causing a drier cooking meat? i’m thinking of this when say i’m using my cast iron to cook a steak…searing it, then cooking and eventually adding a dryrub towards the end…but wouldn’t tenderizing it (not just flattening but piercing the meat) make this all worthless? sorry if i’m naive and wrong…please clarify.